When Should You Start Baby’s First Food? When should parents start baby’s first food? Some parents claim that babies can/should start eating food as early as a few weeks after birth. Others claim that babies are best exclusively breastfed for a full year or longer. Most doctors and official organizations recommend that babies start foods around 4 – 6 months. Keep reading if you want to know the truth about what to feed, when to feed, baby led weaning, and more! What Babies Eat Doesn’t Matter…? According to the mainstream view, a baby’s diet doesn’t matter a whole lot. Choose breastmilk or formula, put rice cereal in a bottle, spoon-feed a 2-week-old pureed veggies, or even hand a 3-month-old a bottle of soda and a cookie. Sure, some of that is extreme — most people don’t put soda in a baby’s bottle, and they hold off on the cookies until more like 8 or 9 months. But the point is, the mainstream doesn’t have a whole lot of knowledge about optimal diets or how to best feed babies, so their choices are rooted more in what “feels” right to them, or what their families did and recommend. Unfortunately, making choices without understanding the reasoning behind them isn’t safe or good. Any legitimate medical professional, whether natural or mainstream, is going to recommend against feeding solids before 4 months, and will especially recommend against feeding junk food before a baby is at least 9 – 12 months (and preferably longer). “My mom did it to me and I’m fine” is not an argument against this. If you haven’t read the first post on infant feeding that deals with breast milk, formula, and mama’s diet, check that out here. We’re diving in to the “baby’s first food” question today! Others say that early exposure to solids helps to avoid allergies, and there is some new research showing this. In a historical society without many of the gut-destroying things we have today — frequent antibiotic use, processed foods, modern pharmaceuticals, pesticides on food, etc. — ” gut health” wouldn’t have been much of a factor in starting solids. When we put that front and center in the discussion, we’re looking at modern issues, not biological needs. What we really need to know is, why do babies need to start solids, and when does that occur? But…why do babies need other foods? Obviously, they do. People can’t survive on a milk-only diet forever. They’re not designed to. The reason babies need other food is because, after several months, they need more nutrients than breast milk can provide. Now, don’t hear me wrong — breastmilk does not become “less” in any way, and is still greatly beneficial well into childhood. But baby is rapidly growing and developing, and his/her needs increase. But back to iron itself. Between 6 and 12 months of age, a baby’s requirements for iron are greater than at any other point in life. They need approximately 0.9 – 1.3 mg/kg each day. (source) For a 15-lb. baby, this translates to around 7 mg/day. For a 20-lb. baby, about 9 mg/day. The official recommendation is 11 mg/day. Let’s talk about the gut. It’s common in the natural community to talk about “open gut” and how babies can’t eat solids before a certain age because this open gut will lead to the development of food allergies. There is nothing the published literature at all about “open gut.” My best guess is that it comes from intestinal permeability studies. Essentially, immature guts are more permeable (that is, food can seep out of the gut, in a way) for a little while. But, the process of maturation, or “closing,” seems to complete somewhere between 3 weeks and 2 months of age. (source) It’s not a significant factor in the timing of the introduction of solids. What about virgin gut? It’s related and many use it interchangeably. But it’s different. Virgin gut is the idea that the gut is sterile at birth and needs time to colonize with optimal microbes, while open gut is intestinal permeability. So! With all that in mind, where does that leave us on starting solids…especially given our diet-doesn’t-matter culture? When Do Babies Really Need to Eat Food? Somewhere between 4 and 9 months, for most babies. A 2018 study looked at the timing of introducing solids, and found that exclusive breastfeeding for longer than 7 months was associated with a greater risk of childhood obesity. So was stopping breastfeeding after 6 months. The optimal situation seemed to be introducing solids around 6 months, while continuing to breastfeed (after breastfeeding exclusively for 6 months). Although, interestingly, when babies were not exclusively breastfed, earlier solids introduction (4 months) was better. Most babies will truly need to eat — and have a desire to do so — between 6 and 9 months. That is, if they’re breastfed. What Should Baby’s First Food Be? Our culture gives a lot of advice about babies’ first foods that is rather…odd, honestly. It’s all based on whether or not a food is allergenic (well, mostly). Our goal with complementary foods is to meet an infant’s specific needs, not just to introduce “something to eat.” Too many babies are under-nourished because of poor quality weaning foods. (source) The foods that are introduced should be nutrient-dense, and rich in iron, zinc, and copper (much lower amounts of copper as human requirements are lower and toxicity of any metal is possible in high amounts). There’s no real reason to avoid grains after 6 months, due to amylase concerns. However, since grains are rich in phytic acid, which blocks the absorption of the key nutrients babies need at this age, it’s best to avoid those grains. It’s also best to avoid refined grains, which are low-nutrition and not what babies need. It is possible to reduce phytic acid in foods through traditional preparation methods, like soaking, sprouting, or souring — which we’ll discuss later. (source) Foods high in phytic acid include nuts, wheat, corn, rice, oats, barley, soy, legumes/beans, peas. (source) These are not good options for early infant foods. So, if these are not good…what should we feed babies? Other vegetarian sources that are higher in iron (soy, seeds, legumes) are also high in phytic acid, which is why they’re not recommended. Spinach is high in oxalic acid, which can block the key nutrients, just like phytic acid. Baby’s first food should ideally be small amounts of the first group — liver, egg yolk, muscle meat. They can be pureed with breast milk or bone broth and fed with a spoon or as a “smoothie” of sorts. Muscle meat can also be cut up small or ground and offered to the baby to eat on his/her own. Basically, any fruit or veggie not high in oxalic or phytic acid is fine to include. Bone broth is also beneficial. Fermented foods can be added closer to the end of the first year. Some are high in salt, which can be hard on immature kidneys, so only small amounts and around 12 months. For those with food allergies, this study addresses new guidelines. No need to wait on specific foods to prevent allergies developing. By the way, there’s no actual evidence that foods need to be introduced one a time, with several days in between. It was suggested to help identify/prevent allergies but there are no actual studies showing that this is necessary or beneficial. It may become necessary if your baby shows signs of reactions to foods, but not necessary for the average baby. In a follow-up post, we’ll discuss what to feed babies in the last few months of the first year and into the second year, as well as looking at weaning and the eventual introduction of phytic-acid containing foods. I haven’t specified, for the most part, how to feed the recommended foods. Baby-led weaning is extremely popular in the natural community, because it’s assumed that this was how all ancestors fed babies, and therefore, it’s the most natural. However, ancient cultures probably did things like pre-masticating (i.e. pre-chewing) for their babies, which no one does today. We’re not really being true to ancient practices. A 2017 meta-analysis of the modern practice shows it will meet most babies’ needs…but not all. It is likely best to introduce a few early foods with a spoon or other type of “assistance” around 6 – 7 months, but give baby as many opportunities as possible to self-feed, especially as baby gets older. There is nothing wrong with homemade purees. Even older kids and adults enjoy blended soups, smoothies, fruit sauces, and so on. Instead of thinking of purees as “baby food,” think of them as a variation on normal household meals. Baby really will need small amounts of food at first, as long as they are nutrient-dense foods. There is no reason to offer low-nutrition processed food “for the experience,” such as common refined cereals. These products also have either refined grains or phytic acid, and most are fortified with synthetic vitamins. Skip them. A combination of feeding methods makes sure that baby gets the nutrients he/she needs, while also giving him/her a chance to explore different textures and flavors and learn to self-feed. Well! That was a lot. And we’ll tackle more in future posts too! 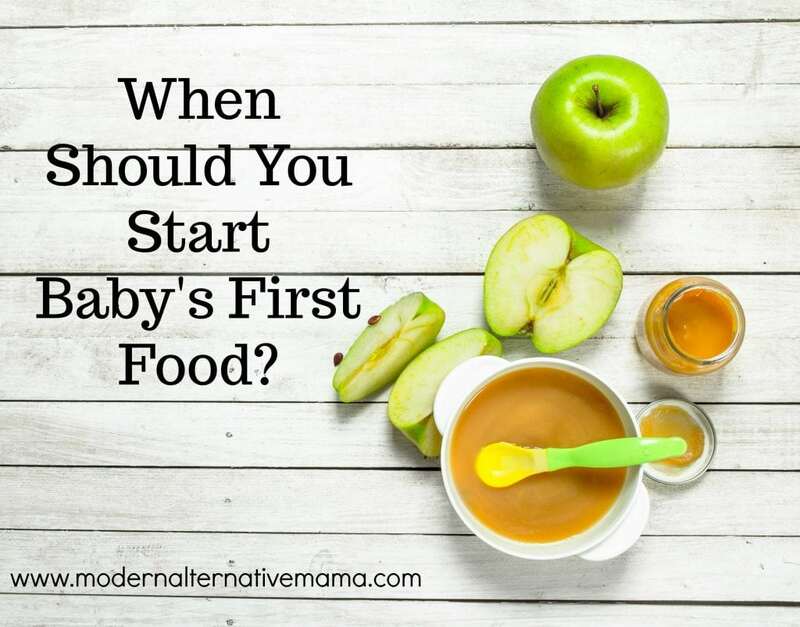 When did start baby’s first food? Get our FREE no-nonsense vaccine guide. Answer your questions with rational, fact-based information instead of fear. I think a huge lingering question here is: so what do you do with a 9 month old baby who is not at all interested in solid foods? By that I mean a baby who pushes away everything you offer and if you do manage to force something into their mouths, it is immediately spat out. Since your research seems to say it’s not healthy for a 10 month old baby to still be exclusively breastfed, how exactly do you force feed a baby solids? I’m well past the baby stage with my 3 children, but I ask because if I had read this years ago when they were babies, it would have completely stressed me out. All 3 of my kids refused everything I offered before 11 months old (13 months for the youngest!) I really don’t think I could have gotten any solids in them before that point no matter how much I tried. Everything other than breastmilk made them gag. Also, interestingly, they all refused bottles. So adding something to pumped milk would have never worked either. I think the only thing that would have worked would be refusing them the breast, so that they would be hungry and desperate for food. That actually was the mainstream advice at the time. But that just didn’t seem right to me. Weaning at 9 months, simply to force them out of sheer starvation to become interested in solids? Really? Not that I was aware of. They were content, energetic, happy babies. Growing well and hitting milestones on time. So I didn’t worry about it. I am curious about this too. My first didn’t want to eat anything until 11 months…but became very interested with no signs of constipation at 14 months. When you puree food with a little liquid, is it okay to use water instead of breast milk or bone broth? I love you for this post!! I questioned myself so much on this topic and had heard all the lies. This makes so much sense, thank you! Thank you for this post! It’s been extremely helpful in navigating which first foods to introduce to my daughter. I have a question about grains. Because they block the key nutrients needed after 6 months, when should they be introduced? Closer to or after 12 months? Also, after 12 months, are all fruits and vegetables game, even those high in phytic acid and/or oxalic acid? Based on your research, I appreciate your opinion on this! Glad to see your post. Was curious what new ideas had come out since my first baby. I know each country has different ideas also. But I think I’ll be sticking to baby dictating when to eat and introducing egg yolk and avocado first. It seemed to be around 9 months-ish when my baby’s got interested. I’m Kate, mama to 5 and wife to Ben. I love meeting new people and hearing their stories. I’m also a big fan of “fancy” drinks (anything but plain water counts as ‘fancy’ in my world!) and I can’t stop myself from DIY-ing everything. I sure hope you’ll stick around so I can get to know you better! A new social site, for natural minded families: Colleqtiv. Join us now! Launching in spring, 2019.